Saakshi Sivaa (born 6 February 1972) is an upcoming actor in Tamil and Telugu television serials. 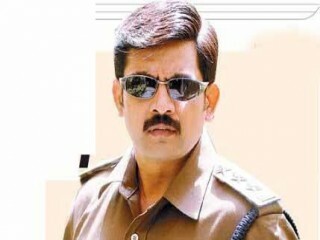 He is best known for his role as Assistant Commissioner Durai (ACD, as his fans affectionately refer to him) in the serial Anandham, currently playing on the Sun TV Tamil network. He has been in the television industry since 2000/2001. Saakshi Sivaa is the youngest son of the late Telugu film actor Saakshi Ranga Rao . Born on 6 February 1972, he is married to Rajyalakshmi. They have a son and a daughter. Saakshi Sivaa is an accomplished badminton player who won state-level championships. His hobbies include playing cricket. Siva is the youngest son of Telugu film actor Saakshi Ranga Rao. Siva is married to Rajyalakshmi, and they have a son and a daughter. Siva is also an accomplished badminton player who has won state-level championships, and a keen cricketer.